Never enter the water alone. Only swim when the water is at your waist height, no deeper. He told us that in Ireland we have cold water and some people can get cold quickly and easily. If this happens and you get a cold shock you should lie on your back. He also warned us about the dangers of swimming in dirty canals, the dangers of rivers and stream and the dangers of slurry pits. He informed us of ways to help others who might get into trouble while swimming. He told us to never put ourselves in danger but to call for help and try to try something like a branch or jumper or even a ball out to them. 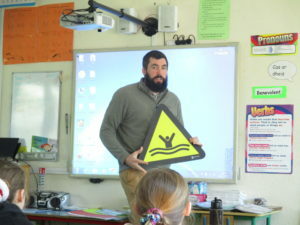 He showed us different water safety signs too. One was new to us, the black and white sign that means surfing or kayaking is taking place and not to go swimming.